In a brief glance away from the political obsession with Brexit, The Guardian ran an interesting report on the 20th of June. It detailed fresh allegations, photographic evidence included, of the Sri Lankan military’s use of cluster bombs during the final stages of the country’s 26 year long civil war. Unsurprisingly, the allegations were rapidly picked up by the Sri Lankan media, although, not as widely as might have been expected. The online Colombo Telegraph immediately picked up and published the Guardian report too. What I want to focus on here, however, is the response that this report elicited in the paper’s discussion forum. The headlining picture was of a demining operative defusing, what looked to be a cluster bomb at Chalai. This was the zone where the civil war reached its bloody apogee in May 2009. The first comment simply states, “It is from another country. Perhaps, Myanmar”. Reacting, the next one fires back, “No thief or murderer will readily admit his guilt. Let an independent and credible investigation determine that”. He continues to add, “No matter how hard SL tries to sweep these things under the carpet, the world seems to continue to haunt it for its lies”. “Hilarious”, retorts a third, “Either this is another joke by the terrorist to gain international support or some country is looking for an excuse to invade”. Now all this could simply be dismissed as standard online posturing – the hectoring megaphone that regularly blights such exchanges. In this case, however, I think it also points to something deeper: Sri Lanka’s crying need, over seven years after the civil war’s end, for redoubled efforts to promote genuine reconciliation. I say ‘process’ advisedly, because if there’s one thing that experiences around the world of efforts to reconcile people in the aftermath of violent conflict indicates, it’s that this takes time. That said, the fact that reconciliation isn’t easy and doesn’t happen through a one-off event, is no reason to not attempt it. On paper at least, the current Sri Lankan Government (GoSL) has committed itself to doing exactly that. One of the transitional justice mechanisms, proposed at the UNHCR in Geneva last September by Foreign Minister Mangala Samaraweera, was to set up a ‘Commission for Truth, Justice, Reconciliation and Non-recurrence’ (TRC). Plus, there are no magic, one-size-fits-all solutions to save a country from the painful process of working out its own ways to heal its people and move on. Eighteen months on, however, movement on making this Commission a reality is proving to be painfully slow. While an official 11-member Reconciliation Consultation Task Force was set up in January, progress with getting things moving on the ground has been minimal. Both, The TRC and other mechanisms, including an Office of Missing Person envisaged by Samaraweera, have been stagnant. The upcoming Geneva session of the UN Human Rights Council (UNHRC) will undoubtedly have the effect of focusing minds on these issues in Colombo. But even if the imperative of moving forward decisively with reconciliation does receive increased official attention, the next question will be the shape and form that this attention assumes. At the very least, we must hope that it learns from the mistakes made in the recent roll out of the Office of Missing Persons. Virtually none of the public consultation with families of the disappeared and other concerned civil society organisations (which was earlier promised by the government) was carried out. Instead, without further comment, a new bill was sent straight to the parliament. These mistakes need to be kept in mind as they are critical. A Sri Lankan TRC-type body must ensure that a wide range of people – Sinhalese, Tamils and Muslims – have access to the mirror of the Commission. From South Africa to Peru to Colombia and Mindanao today, the experience of Truth Commissions (TRCs) points out the importance of wide-ranging public consultation over both- the design and implementation- of a Commission’s mandate. As a Peruvian Commissioner once said to me, “we are holding up a mirror to our society”. If a Sri Lankan TRC-type body has any ambition to do something similar, it needs to do all it can to ensure that a wide range of people – Sinhalese, Tamils and Muslims – have access to the mirror of the Commission. They should be able to see their own faces and those of family members and friends they lost during the conflict. Let’s come back to the online disputants. 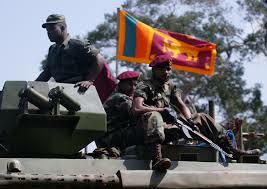 If their responses indicate anything in this context, it is that for all the progress achieved on many fronts since the war’s end, Sri Lanka remains a divided society, with many deep scars yet to be healed. Setting up a well-thought-out, properly functioning TRC would be a good place to begin the process of addressing this pain. There could not be a better time for the government to begin doing so than now. Mark Salter is a writer and researcher focusing on issues of democracy, conflict, reconciliation and diversity management.